Once the holiday season rolls around, it is time to break out the decorations, put up the tree and decorate your house. It is a lot of work to set everything up year after year, and may be tired of doing the same old thing. But, this year you can revive the Christmas season with new decor themes to bring your home to life. Make your mantle or fireplace a great focal point with garland that is laced with red lights, peppermint-striped ribbon, ornaments and bulbs. Use peppermint inspired LED candles as a great addition to your mantle or tabletop. A pre-lit red and white striped tree will light up your home and look simply sweet. And, of course, light a peppermint-scented candle so your house smells delicious. Incorporate wreaths and garland that feature gold and silver ornaments, accessories and bulbs. Decorate with any items that are glittery, shiny or sparkly in your staple colors. Set out fresh centerpieces with white flowers and gold accessories as a wonderful addition to your dining room or living room table. Finally, cover your tree in sequined gold ornaments. 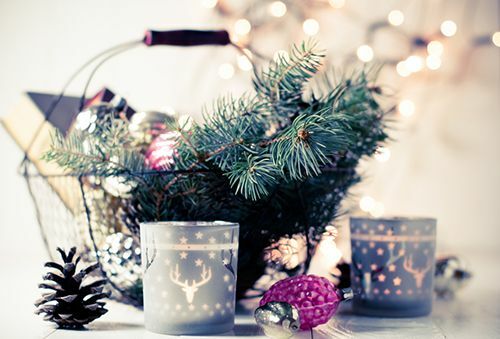 Decorate with pinecones, pine trees, berries and woodland creatures. You can naturally integrate pinecones into a winter garland. If you want to be playful, construct a large twig stag to be placed in the yard or a miniature version to replace a centerpiece. Create natural ornaments using materials like twine and wood for simple touches to your theme. Then, set out centerpieces that feature pine cones and greenery. Overall, a Christmas naturescape theme will bring the gentle, snowy forest into your home. Put together a colorful ornament wreath to add personality and character to your space. Decorate with purple mini Christmas trees, pearl string lights and mesh ribbons in a variety of colors. Find colorful ornaments to hang on your colored tree. Don’t be afraid to mix and match these colors. And, most importantly, remember that color is your friend with this theme, so don’t hold back. Don’t let your Christmas spirit get dragged down by your old, tired decor. Each of these themes is easy to tackle and make on your own. If you are nervous about a complete overhaul, you can add fresh centerpieces or lights for a simpler Christmas update. Remember, anything fresh will give your home a lively feel and make it smell great. Happy holidays!